Selecting a paint color can be overwhelming. With thousands of options, it can be tough to imagine what a particular color will look like on your walls or on your house. Use PPG Paints online room visualizer to see how paint colors will look in your home – before picking up a paint brush. 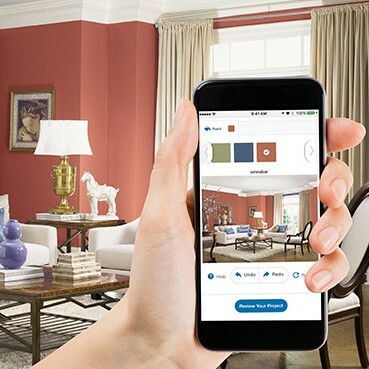 With the launch of our new virtual room painter tool, we have enabled anyone searching for the perfect color to try paint colors and palettes without visiting a paint store or lifting a brush. Powered by proprietary technology and created by PPG’s award-winning developers, the tool provides a realistic color preview and is now available. Test colors faster thanks to intuitive “edge-detect” functionality, which quickly and automatically finds and maps the ends of a wall within a photo. So long to the days of using tools to draw lines or to select specific surfaces in photos to colorize them. Once you select your color choices, simply touch or click on the photo for quick digital painting. The tool also provides an edit function for exact precision. One-stop shop – A separate app is no longer required to select and try paint colors. The tool can be used directly from our website on a mobile device or computer. Realistic visualization – When using a personal photo, the tool’s advanced technology takes into account characteristics of a room such as lighting conditions for accurate color visualization. Color options in a click – It’s simple to upload a photo of your home or try PPG’s inspiration room photos to try color options. To test colors, select from color families and curated color palettes, search for specific color names, or upload a photo to match colors. Gather input from family and friends – Do you want to get others’ opinions on your color selections? Request input from friends by clicking on email, Facebook or Pinterest sharing icons within the tool. Save, then paint – Once you find a color you love, save the project by simply entering an email address – there is no need to create an account to access a project at a later time. You can also receive an email with your favorite paint color choices and a colorized room image for future reference when purchasing paint. Follow this living room painting guide for best results.